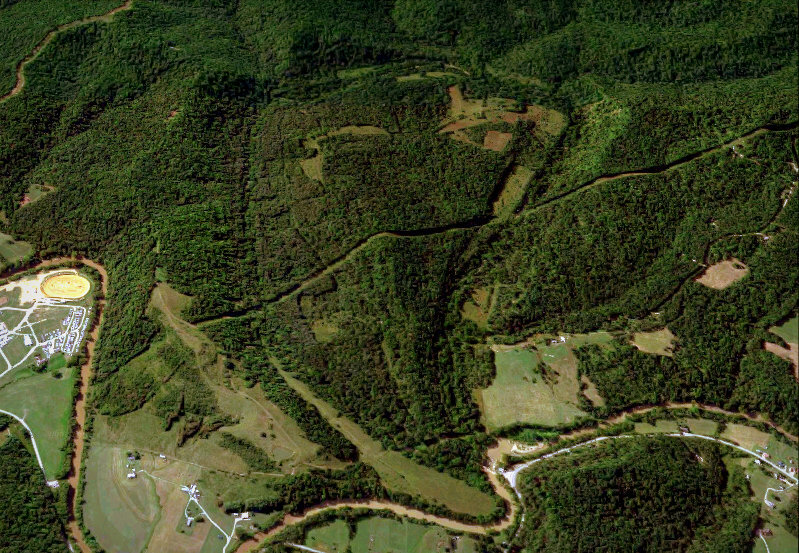 An aerial image provide by Google Maps shows the Jug on Middle Island Creek looking southward. Long before I’d seen it, I’d become fascinated by the idea of visiting “The Jug” on Middle Island Creek, one of the more peculiar geographic features in northern West Virginia. 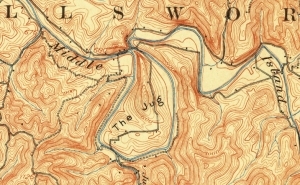 A geologic map shows the Jug in 1924. Near Middlebourne, nearly halfway along its course, Middle Island Creek meanders almost four miles southward through a jug-shaped bend before returning to meet itself, or nearly so. The meander has time-out-of-mind been known as The Jug and has been a curiosity since its discovery by European explorers in the 1700s and had certainly been so before. The narrow neck of land that separates the winding stream is now perhaps no more than 100 feet across, depending on the amount of water being carried downstream, and in recent years the water in the Jug has dwindled into a series of long pools, which can be canoed with some portage, as much of the water has been allowed to breach the neck. Officials with the W.Va. Division of Natural Resources have been eager to engage the W.Va. Division of Highways to replace and raise the low-water bridge that follows the neck, thereby returning water to the meander. As a result of flooding and erosion, the bridge is now impassable, and the Division of Natural Resources is no longer able to maintain the 400-and-some acres of field and forest within the Jug, and the meander, which was once a favorite destination for anglers, is largely devoid of fish. The stream drops nearly 10 feet in its course around the jug — a fall great enough to have powered a series of grist mills, none of which long survived as a result of Middle Island Creek’s power. 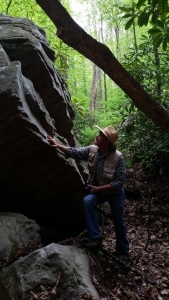 West Virginia Explorer editor David Sibray explores a cliff in a West Virginia forest. Photo courtesy Gary Morefield. Many stories and traditions surround this strange formation. It is said that a group of pioneers following the creek once stopped to decide whether or not to continue downstream or camp for the night. Unable to agree, the party split into two groups. After traveling some seven miles farther, the second party stopped to camp, but in the morning discovered themselves near the camp of the party they’d left behind. The State Road Commission in the 1930s built a small dam and bridge across the neck to prevent further erosion that would leave the meander dry and eliminate the Jug altogether. At about that time the land within the Jug was acquired by the State Game Commission as a public hunting preserve, which is now part of the 2,848-acre Jug Wildlife Management Area, a destination for naturalists and hunters in search of deer, grouse, squirrel, rabbit, turkey, waterfowl, and migratory birds. I’ve not yet been able to reach anyone at the W.Va. Division of Highways who can tell me when state residents might expect the bridge across the neck to be fixed and the full force of the stream returned to the Jug. I think that someday the Jug’s meander could become a valuable economic resource. In few other places can canoeists and boaters embark on a downstream journey and disembark at the same place. The whole of the creek, in fact, is ideal for a water trail along which visitors could discover more of the cultural and natural history of the vale of Middle Island Creek.